Throughout the weekend, there will be a series of foodie talks in our Foodies Lounge, where you can, hopefully, learn some new things about food and drink. They will led by local food heroes and are meant to be both informative and fun. If you're lucky, you might also get some free samples! Nenette is an artisan chocolatier who trained with some of the biggest names in chocolate, including award-winning Swiss chocolatier Carlo Melchior whose chocolates you will find in Fortnam and Masons. She has been making her own chocolate for ten years and combines her tempered chocolate with fresh, seasonal ingredients to create delicious chocolates and truffles, bars and shapes. Nenette is based just over the county border in a village in South Leicestershire. She will be Talking Chocolate. Drinks entrepreneur Laurence began distilling in 2011 – the same year his flagship cider became a CAMRA Champion cider. He started off – naturally – with apple brandy but his still now produces a full pantechnicon of spirits - rum, whisky, even beetroot vodka. Laurence recently took over Wakefield Estate farm shop in Potterspury where he sells his fine liquor along with a host of other goodies. He is turning the shop into a must for foodies with tastings and pop-up dining events. Laurence will be Talking Gin, with a talk entitled ‘Naked gin – Secrets of the gin world’. He will touch on the history of gin, describe the varying styles – what makes London Dry different to Plymouth for instance – and explain alternative production methods. David is an award winning butcher and part of a fabled farming family. On each day of the festival, he will run his Steak School in the Foodies Lounge. He will butcher a so-called roasting – the part of the beast that runs from the fore-rib to the rump and includes every well-known steak – rib-eye, sirloin, fillet and rump. 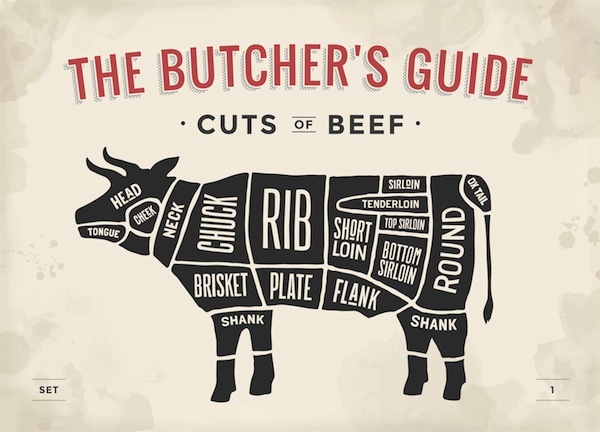 As he goes, he will explain what gives each piece of meat its characteristic texture and flavour and tell you what you should be looking for when you shop for beef. Bob Price is an expert on chilli. He grows 10,000 chilli plants a year, encompassing 45 varieties, on a farm near Newark in Nottinghamshire. He and son Neal have been selling chilli plants, pods and home-made chutneys and sauces for five years. They sell to the public, sauce manufacturers and use the home-grown chillies in their products. Bob will be Talking Chilli - cooking with them for flavour rather than heat. Gary turned his back on life as a deskbound Mac operator to launch Hamm Tun Fine Foods, the only cheese maker in Northampton. His first cheese - Cobblers Nibble cheese – quickly became a local legend and has gone on to win a string of awards. It is a hard English cheese made traditionally by hand with milk from a Northamptonshire Fresian herd. He also makes a soft cheese - Cobblers Nibble Gold, made from pasteurised cows’ milk and washed in Guilsborough Gold beer from Nobby’s brewery in Guilsborough - and a Northamptonshire blue. Gary will be Talking Cheese, and providing some free samples.